It can be easy to second-guess what should have happened in the game. Was the bullpen approach the best option or should the team have gone the traditional route and started Edwin Jackson or Mike Fiers? And with the bullpen situation, was the order of the relievers’ entry into the game the best? Or how about the A’s failing to capitalize with their hitting and not stranding so many runners? It’s hard not to look at the individual situations in the game but I feel that since the season wasn’t even supposed to finish in October, I don’t look back in anger. What I saw was a team coming of age and now with a taste of October, has to come back next season even stronger and more prepared to take the division. Ignoring all that went wrong on Wednesday, I am looking forward to seeing Blake Treinen dominate again. We have some young studs in the pen and a lineup that is pretty formidable. 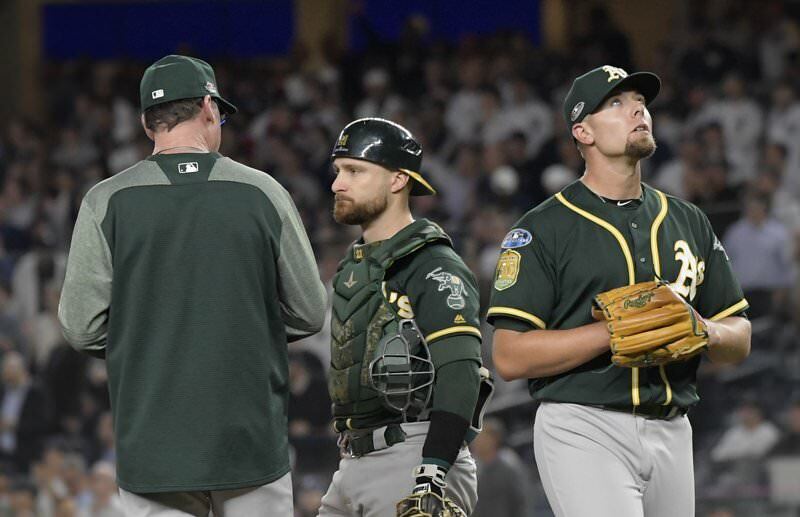 Khris Davis, Matt Olson, Matt Chapman and Ramon Laureano are some of the names that we want to see excel next season again. Of course the rotation needs some big help but I want to believe that the front office can make that happen. That’s next year. This year’s ending still hurts and I will get over it. But it doesn’t wipe away an amazing season for the A’s. It’s still hard not to wonder about the “what ifs” from the game. But I want to focus on what did happen. And it was a whole lot of fun. I want to see more of that next year. This is only the beginning. The story isn’t over yet. This entry was posted in Commentary, MLB, Oakland Athletics, Playoffs and tagged MLB Playoffs 2018. Bookmark the permalink. ← NHL All-Star Game logo: Is technology San Jose’s only identity?